This is a print advertisement from the joint campaign. 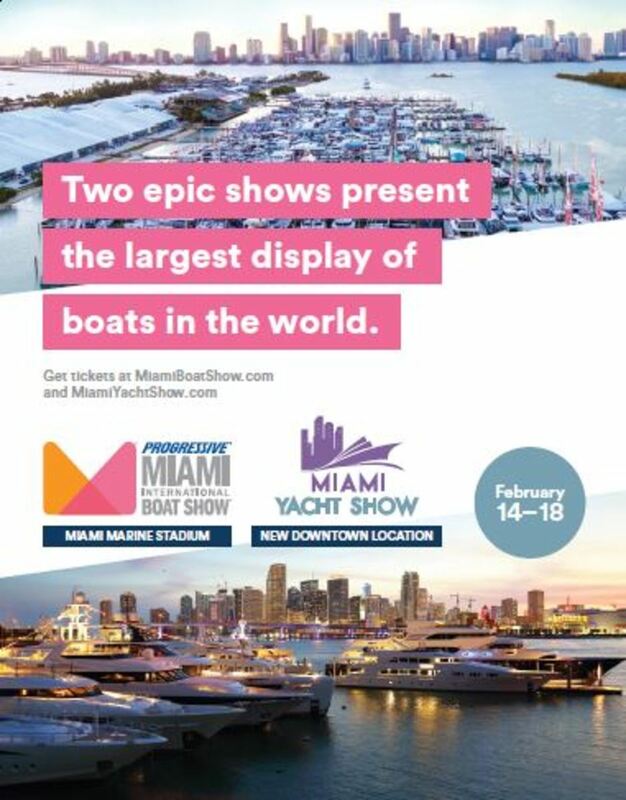 Organizers of the Progressive Miami International Boat Show and the Miami Yacht Show are partnering for the first time on a joint marketing campaign in an effort to reach a larger audience and create a more seamless experience for attendees. The National Marine Manufacturers Association, owners of the Miami International Boat Show, and Informa, which co-owns the Miami Yacht Show with International Yacht Brokers Association, will work together to promote the shows that run concurrently Feb. 14-18. The partnership should help attendees learn about both shows, NMMA senior vice president and chief communications officer Ellen Hopkins Bradley told Trade Only Today. 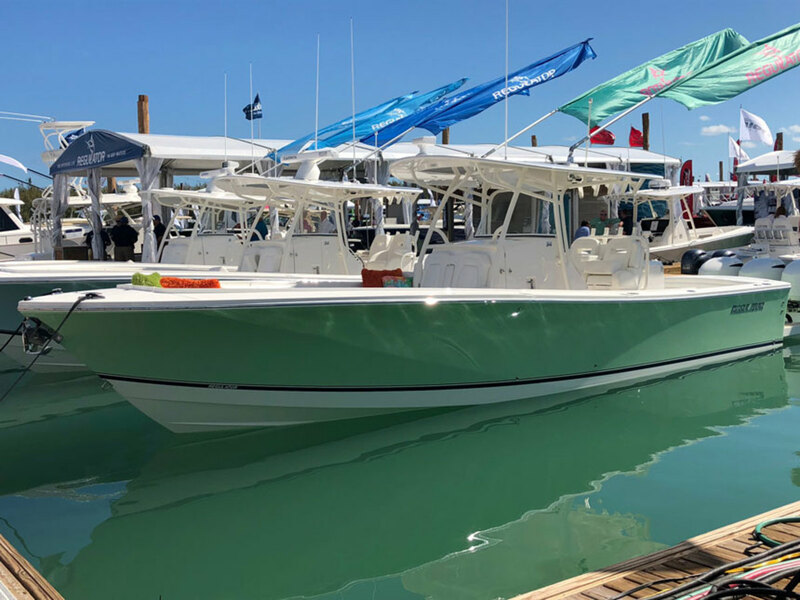 “Because we have people going back and forth between the two shows, we’ve done some cross promotion with both of our events,” Informa’s U.S. boat shows general manager Andrew Doole told Trade Only. Prompting the partnership is the 2019 move of the Miami Yacht Show to downtown Miami at One Herald Plaza, across Biscayne Bay from the Miami International Boat Show at Miami Marine Stadium. The new venue is also in closer proximity to Miami Yacht Show’s Super Yacht Miami at Island Gardens on Watson Island. Combined, the shows will bring nearly 2,000 boats, yachts and superyachts to Miami over President’s Day weekend. The Miami International Boat Show will feature more than 1,400 new boats ranging in size from 10 feet to 100 feet, and the Miami Yacht Show and Super Yacht Miami will feature more than 500 new and brokerage yachts and superyachts ranging from 40 feet to over 320 feet. The partnership includes a joint advertising campaign, a combination ticket for those looking to attend both events, and free shuttle bus transportation between both shows. Because both shows are located along Miami’s Biscayne Bay, they can both be accessed via dedicated park-and-ride lots and public transportation, including Miami’s Metrorail and new Brightline train service. The Miami Boat Show is also offering free water taxi service from Bayfront Park and American Airlines Arena; and the Miami Yacht Show will run VIP tenders between its Miami Yacht Show site and its Super Yacht Miami site. The joint advertising campaign began Dec. 1st and runs through both events. “This is the first time both shows — which are owned by two different entities — have come together to answer the question, ‘how can we work together for the greater good of the recreational boating community?’” said NMMA president Thom Dammrich in a statement.